Lester Young had an incredibly productive year with Basie’s band in 1939, including some of his most classic performances on tenor sax. The following selections show him at his peak of creativity, and playing with band mates like Basie who perfectly complemented his easy going style. In “Taxi War Dance,” Basie’s orchestra strips the big band swing format down to a bare minimum of complexity, and then builds it back into something transcendent by sole virtue of their talent – especially that of the amazing Lester Young. At its core, the song is nothing but a “head arrangement” – a brief riff repeated against a driving rhythm. What transforms this simple structure into pure magic are the memorable solos that fill the remaining spaces. The record begins with Basie introducing the fast pace on piano and then some taut riffing by the full orchestra, but just seconds into it everything but the rhythm section fades away and Young steps in with a breezy tenor sax solo that completely changes the song’s feel. The band riffs again and Dickie Wells picks up where Young left off with a remarkably agile display on trombone. Then we are treated to a series of brief riffs followed by short, highly inventive improvisations that each defy expectations and create something fresh and new. In the hands of lesser musicians, an arrangement like “Taxi War Dance” could be flat and repetitive, but as played on this record, it is marvelous. 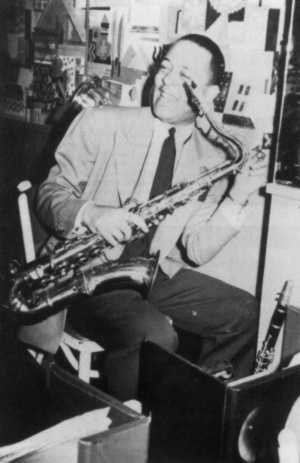 “Lester Leaps In” was written by Lester Young based on George and Ira Gershwin’s “I Got Rhythm.” Like the band’s other head arrangements, it features improvised solos built around a central riff, but where we might expect more of the band’s usual free-for-all virtuosity, this record is a study in minimalism. There are only two soloists – Basie on piano and Young on tenor sax – and they take turns seeing who can play the most with the least. Both show considerable flash at times, but they are even more brilliant in their use of space. Young is clearly the main focus. His playing is fluid yet very laid-back, and he frequently plays around with the rhythm, delaying an expected note by a fraction, or pauses all together, trailing off where one might expect more fireworks. Basie’s approach, as might be expected, is even sparer, sometimes playing only a couple of quiet notes at a time. Despite the sparseness of his playing, or perhaps because of it, the record is bursting with energy from start to finish. The rhythm section is lively and keeps the beat going even when the melody disappears. And the occasional heat generated by the band (led by Buck Clayton’s prominent trumpet) and soloists leave you eagerly anticipating more. This classic is one of Basie’s best and the ultimate chill-out swing record, a relaxed jam built around a very simple riff. The band plays very tight, very spare snippets: at one point, the riff consists of just two tense notes, just enough to keep it going during the solos. Dickie Wells is prominent with a repeated casual growl on trombone, and the rhythm section keeps things bouncing steadily, especially Jo Jones’ light but firm touch on drums. 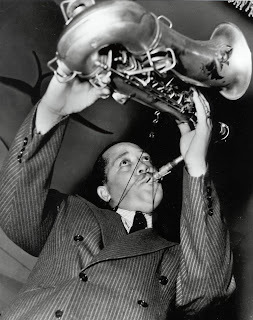 Meanwhile, the soloists take turns playing smooth, comfortable choruses, and all are magic: Lester Young especially shines with an ethereal performance on tenor sax. He is followed by Harry Eddison on trumpet, Basie on piano, Jack Washington on baritone sax and Dickie Wells on trombone. The records fades sleepily to a close guided by Wells’ trombone.